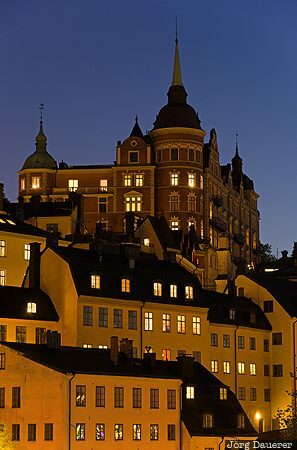 The houses of Södermalm with illuminated windows at the blue hour after sunset seen from Centralbron. Stockholm is in Stockholms län, Sweden. This photo was taken in the evening of a sunny day in September of 2014. This photo was taken with a digital camera.